The strangest monument in America looms over a barren knoll in northeastern Georgia. Five massive slabs of polished granite rise out of the earth in a star pattern. The rocks are each 16 feet tall, with four of them weighing more than 20 tons apiece. Together they support a 25,000-pound capstone. Approaching the edifice, it’s hard not to think immediately of England’s Stonehenge or possibly the ominous monolith from 2001: A Space Odyssey . Built in 1980, these pale gray rocks are quietly awaiting the end of the world as we know it. 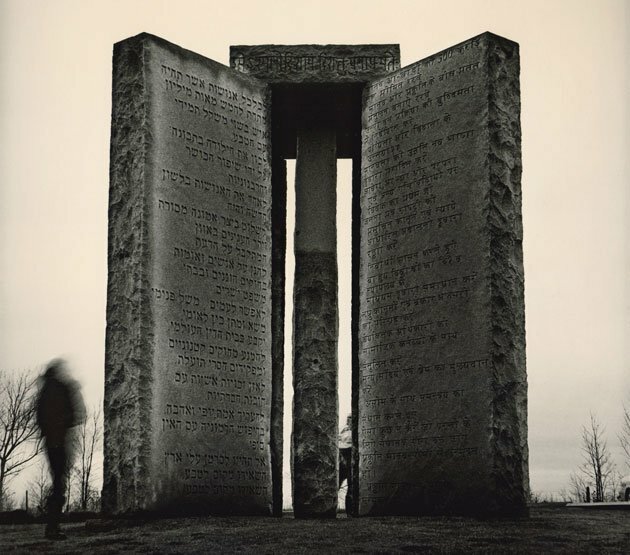 What’s most widely agreed upon—based on the evidence available—is that the Guidestones are meant to instruct the dazed survivors of some impending apocalypse as they attempt to reconstitute civilization. Not everyone is comfortable with this notion. A few days before I visited, the stones had been splattered with polyurethane and spray-painted with graffiti, including slogans like “Death to the new world order.” This defacement was the first serious act of vandalism in the Guidestones’ history, but it was hardly the first objection to their existence. In fact, for more than three decades this uncanny structure in the heart of the Bible Belt has been generating responses that range from enchantment to horror. Supporters (notable among them Yoko Ono) have praised the messages as a stirring call to rational thinking, akin to Thomas Paine’s The Age of Reason . Opponents have attacked them as the Ten Commandments of the Antichrist. 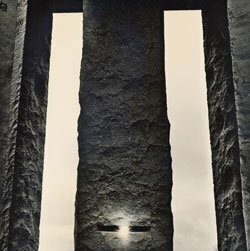 Whoever the anonymous architects of the Guidestones were, they knew what they were doing: The monument is a highly engineered structure that flawlessly tracks the sun. It also manages to engender endless fascination, thanks to a carefully orchestrated aura of mystery. And the stones have attracted plenty of devotees to defend against folks who would like them destroyed. Clearly, whoever had the monument placed here understood one thing very well: People prize what they don’t understand at least as much as what they do. 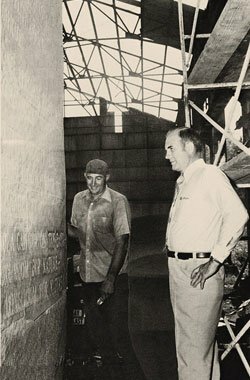 The story of the Georgia Guidestones began on a Friday afternoon in June 1979, when an elegant gray-haired gentleman showed up in Elbert County, made his way to the offices of Elberton Granite Finishing, and introduced himself as Robert C. Christian. He claimed to represent “a small group of loyal Americans” who had been planning the installation of an unusually large and complex stone monument. Christian had come to Elberton—the county seat and the granite capital of the world—because he believed its quarries produced the finest stone on the planet. Joe Fendley, Elberton Granite’s president, nodded absently, distracted by the rush to complete his weekly payroll. But when Christian began to describe the monument he had in mind, Fendley stopped what he was doing. Not only was the man asking for stones larger than any that had been quarried in the county, he also wanted them cut, finished, and assembled into some kind of enormous astronomical instrument. What in the world would it be for? Fendley asked. Christian explained that the structure he had in mind would serve as a compass, calendar, and clock. It would also need to be engraved with a set of guides written in eight of the world’s major languages. And it had to be capable of withstanding the most catastrophic events, so that the shattered remnants of humanity would be able to use those guides to reestablish a better civilization than the one that was about to destroy itself. Built to survive the apocalypse, the Georgia Guidestones are not merely instructions for the future—the massive granite slabs also function as a clock, calendar, and compass. The monument sits at the highest point in Elbert County and is oriented to track the sun’s east-west migration year-round. On an equinox or solstice, visitors who stand at the west side of the “mail slot” are positioned to see the sun rise on the horizon. An eye-level hole drilled into the center support stone allows stargazers on the south side to locate Polaris, the North Star. A 7/8-inch hole drilled through the capstone focuses a sunbeam on the center column and at noon pinpoints the day of the year. Fendley is now deceased, but shortly after the Guidestones went up, an Atlanta television reporter asked what he was thinking when he first heard Christian’s plan. “I was thinking, ‘I got a nut in here now. How am I going get him out? '” Fendley said. He attempted to discourage the man by quoting him a price several times higher than for any project commissioned there before. The job would require special tools, heavy equipment, and paid consultants, Fendley explained. But Christian merely nodded and asked how long it would take. Fendley didn’t rightly know—six months, at least. He wouldn’t be able to even consider such an undertaking, he added, until he knew it could be paid for. When Christian asked whether there was a banker in town he considered trustworthy, Fendley saw his chance to unload the strange man and sent him to look for Wyatt Martin, president of the Granite City Bank. Martin led Christian down the street to the town square, where the city had commissioned a towering Bicentennial Memorial Fountain, which included a ring of 13 granite panels, each roughly 2 by 3 feet, signifying the original colonies. “I told him that was about the biggest project ever undertaken around here, and it was nothing compared to what he was talking about,” Martin says. “That didn’t seem to bother him at all.” Promising to return on Monday, the man went off to charter a plane and spend the weekend scouting locations from the air. “By then I half believed him,” Martin says. Construction of the Guidestones got under way later that summer. Fendley’s company lovingly documented the progress of the work in hundreds of photographs. Jackhammers were used to gouge 114 feet into the rock at Pyramid Quarry, searching for hunks of granite big enough to yield the final stones. Fendley and his crew held their breath when the first 28-ton slab was lifted to the surface, wondering if their derricks would buckle under the weight. 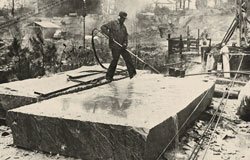 A special burner (essentially a narrowly focused rocket motor used to cut and finish large blocks of granite) was trucked to Elberton to clean and size the stones, and a pair of master stonecutters was hired to smooth them. 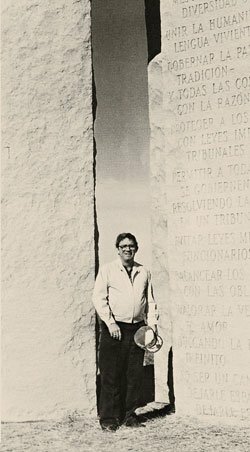 Fendley and Martin helped Christian find a suitable site for the Guidestones in Elbert County: a flat-topped hill rising above the pastures of the Double 7 Farms, with vistas in all directions. For $5,000, owner Wayne Mullinex signed over a 5-acre plot. 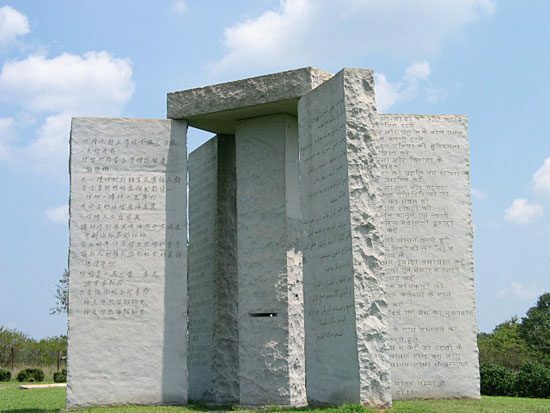 In addition to the payment, Christian granted lifetime cattle-grazing rights to Mullinex and his children, and Mullinex’s construction company got to lay the foundation for the Guidestones. With the purchase of the land, the Guidestones’ future was set. Christian said good-bye to Fendley at the granite company office, adding, “You’ll never see me again.” Christian then turned and walked out the door—without so much as a handshake. The astrological specifications for the Guidestones were so complex that Fendley had to retain the services of an astronomer from the University of Georgia to help implement the design. The four outer stones were to be oriented based on the limits of the sun’s yearly migration. The center column needed two precisely calibrated features: a hole through which the North Star would be visible at all times, and a slot that was to align with the position of the rising sun during the solstices and equinoxes. The principal component of the capstone was a 78-inch aperture through which a beam of sunlight would pass at noon each day, shining on the center stone to indicate the day of the year. The main feature of the monument, though, would be the 10 dictates carved into both faces of the outer stones, in eight languages: English, Spanish, Russian, Chinese, Arabic, Hebrew, Hindi, and Swahili. A mission statement of sorts (let these be guidestones to an age of reason) was also to be engraved on the sides of the capstone in Egyptian hieroglyphics, classical Greek, Sanskrit, and Babylonian cuneiform. The United Nations provided some of the translations (including those for the dead languages), which were stenciled onto the stones and etched with a sandblaster. By early 1980, a bulldozer was scraping the Double 7 hilltop to bedrock, where five granite slabs serving as a foundation were laid out in a paddle-wheel design. A 100-foot-tall crane was used to lift the stones into place. Each of the outer rocks was 16 feet 4 inches high, 6 feet 6 inches wide, and 1 foot 7 inches thick. The center column was the same (except only half the width), and the capstone measured 9 feet 8 inches long, 6 feet 6 inches wide, and 1 foot 7 inches thick. Including the foundation stones, the monument’s total weight was almost 240,000 pounds. Covered with sheets of black plastic in preparation for an unveiling on the vernal equinox, the Guidestones towered over the cattle that continued to graze beneath it at the approach of winter’s end. The unveiling on March 22, 1980, was a community celebration. Congressmember Doug Barnard, whose district contained Elberton, addressed a crowd of 400 that flowed down the hillside and included television news crews from Atlanta. Soon Joe Fendley was the most famous Elbertonian since Daniel Tucker, the 18th-century minister memorialized in the folk song “Old Dan Tucker.” Bounded by the Savannah and Broad rivers but miles from the nearest interstate—”as rural as rural can be,” in the words of current Star publisher Gary Jones—Elberton was suddenly a tourist destination, with visitors from all over the world showing up to see the Guidestones. “We’d have people from Japan and China and India and everywhere wanting to go up and see the monument,” Martin says. And Fendley’s boast that he had “put Elberton on the map” was affirmed literally in spring 2005, when National Geographic Traveler listed the Guidestones as a feature in its Geotourism MapGuide to Appalachia. But many who read what was written on the stones were unsettled. Guide number one was, of course, the real stopper: maintain humanity under 500,000,000 in perpetual balance with nature. There were already 4.5 billion people on the planet, meaning eight out of nine had to go (today it would be closer to 12 out of 13). This instruction was echoed and expanded by tenet number two: guide reproduction wisely—improving fitness and diversity. It didn’t take a great deal of imagination to draw an analogy to the practices of, among others, the Nazis. Guide number three instructed readers to unite humanity with a living new language. This sent a shiver up the spine of local ministers who knew that the Book of Revelations warned of a common tongue and a one-world government as the accomplishments of the Antichrist. Guide number four—rule passion—faith—tradition—and all things with tempered reason—was similarly threatening to Christians committed to the primacy of faith over all. The last six guides were homiletic by comparison. protect people and nations with fair laws and just courts. let all nations rule internally resolving external disputes in a world court. avoid petty laws and useless officials. balance personal rights with social duties. prize truth—beauty—love—seeking harmony with the infinite. be not a cancer on the earth—leave room for nature—leave room for nature. Even as locals debated the relative merits of these commandments, the dire predictions of Travenstead seemed to be coming true. Within a few months, a coven of witches from Atlanta adopted the Guidestones as their home away from home, making weekend pilgrimages to Elberton to stage various pagan rites (“dancing and chanting and all that kind of thing,” Martin says) and at least one warlock-witch marriage ceremony. No humans were sacrificed on the altar of the stones, but there are rumors that several chickens were beheaded. A 1981 article in the monthly magazine UFO Report cited Naunie Batchelder (identified in the story as “a noted Atlanta psychic”) as predicting that the true purpose of the guides would be revealed “within the next 30 years.” Viewed from directly overhead, the Guidestones formed an X, the piece in UFO Report observed, making for a perfect landing site. Visitors kept coming, but after several failed investigations into the identity of R. C. Christian, the media lost interest. Curiosity flared again briefly in 1993, when Yoko Ono contributed a track called “Georgia Stone” to a tribute album for avant-garde composer John Cage, with Ono chanting the 10th and final guide nearly verbatim: “Be not a cancer on Earth—leave room for nature—leave room for nature.” A decade later, however, when comedienne Roseanne Barr tried to work a bit on the Guidestones into her comeback tour, nobody seemed to care. Christian kept in touch with Martin, writing the banker so regularly that they became pen pals. Occasionally, Christian would call from a pay phone at the Atlanta airport to say he was in the area, and the two would rendezvous for dinner in the college town of Athens, a 40-mile drive west of Elberton. By this time, Martin no longer questioned Christian’s secrecy. The older man had successfully deflected Martin’s curiosity when the two first met, by quoting Henry James’ observations of Stonehenge: “You may put a hundred questions to these rough-hewn giants as they bend in grim contemplation of their fallen companions, but your curiosity falls dead in the vast sunny stillness that enshrouds them.” Christian “never would tell me a thing about this group he belonged to,” Martin says. The banker received his last letter from Christian right around the time of the 9/11 terrorist attacks and assumes the man—who would have been in his mid-eighties—has since passed away. The mysterious story of R. C. Christian and the absence of information about the true meaning of the Guidestones was bound to become an irresistible draw for conspiracy theorists and “investigators” of all kinds. Not surprisingly, three decades later there is no shortage of observers rushing to fill the void with all sorts of explanations. Ironically, Dice’s message has mainly produced greater publicity for the Guidestones. This, in turn, has brought fresh visitors to the monument and made Elbert County officials even less inclined to remove the area’s only major tourist attraction. 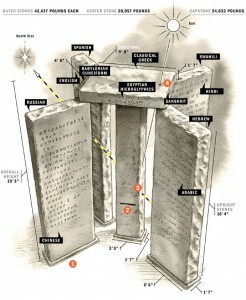 Dice, of course, is far from the only person with a theory about the Guidestones. Jay Weidner, a former Seattle radio commentator turned erudite conspiracy hunter, has heavily invested time and energy into one of the most popular hypotheses. He argues that Christian and his associates were Rosicrucians, followers of the Order of the Rosy Cross, a secret society of mystics that originated in late medieval Germany and claim understanding of esoteric truths about nature, the universe, and the spiritual realm that have been concealed from ordinary people. Weidner considers the name R. C. Christian an homage to the legendary 14th-century founder of the Rosicrucians, a man first identified as Frater C.R.C. and later as Christian Rosenkreuz. Secrecy, Weidner notes, has been a hallmark of the Rosicrucians, a group that announced itself to the world in the early 17th century with a pair of anonymous manifestos that created a huge stir across Europe, despite the fact that no one was ever able to identify a single member. While the guides on the Georgia stones fly in the face of orthodox Christian eschatology, they conform quite well to the tenets of Rosicrucianism, which stress reason and endorse a harmonic relationship with nature. On hearing Weidner’s ideas, Martin shakes his head and says it’s “the sort of thing that makes me want to tell people everything I know.” Martin has long since retired from banking and no longer lives in Elberton, yet he’s still the Guidestones’ official—and only—secret-keeper. “But I can’t tell,” the old man quickly adds. “I made a promise.” Martin also made a promise to destroy all the records of his dealings with Christian, though he hasn’t kept that one—at least not yet. In the back of his garage is a large plastic bin (actually, the hard-sided case of an IBM computer he bought back in 1983) stuffed with every document connected to the Guidestones that ever came into his possession, including the letters from Christian. For years Martin thought he might write a book, but now he knows he probably won’t. What he also won’t do is allow me to look through the papers. When I ask whether he’s prepared to take what he knows to his grave, Martin replies that Christian would want him to do just that: “All along, he said that who he was and where he came from had to be kept a secret. He said mysteries work that way. If you want to keep people interested, you can let them know only so much.” The rest is enshrouded in the vast sunny stillness. Randall Sullivan (randysul@aol.com) wrote about the electric-vehicle company ZAP in issue 16.04.